This half terms focus is on Invasion Games and we have some very special guests helping to deliver our lessons. Brooklands Lacrosse coaches will be delivering sessions to the Upper Juniors and Manchester United and Sale Sharks will be delivering sessions to the Lower Juniors. The Infants will also be taking part in Invasion Games and Foundation Stage will begin their Physical Literacy Programme. This half term also sees us beging our leadership programme in which Year 6 children will be delivering clubs and even some P.E. lessons to the Infants. This will involve planning, delivering and assessing! At Gorse Hill Primary our ethos is ‘Sport for All’. For some of our children school sport is the only sport they will do, for some it will give them an interest which we will encourage them to follow up with our local club links. By the time children have left Gorse Hill at the end of Year 6 we want every child to have represented the school team in at least 2 sports. Last year we achieved this. This is much more important to us than a ‘winning is everything’ mentality which we notice at tournaments and festivals as some schools select the same small number of children for every sport they do. Despite this we have had huge sporting success over the last year winning lots of events. Please see our honours list to share our success.. In June 2015 we were awarded the Gold Kite mark for PE. Children should wear a plain white tee-shirt, black shorts and trainers/pumps for P.E. Infant children will always have the hall available for P.E. but Junior lessons are usually outside so tracksuits and waterproofs will be allowed in bad weather. Children must remove all jewellery prior to PE lessons and long hair must be tied back. If children forget their Kits, a school PE kit is provided (even if swimming). Last year our Sports Leaders were so good that we are giving them even more responsibility this year. They can be easily identified by their badges and help with a wide range of things from teaching the infants to tidying the P.E. cupboard. At the end of the year they will meet with Stretford High Schools Year 11 Sports Leaders and plan and deliver our Infant Sports day. If you have any suggestions for clubs you would like to see please let our Sports Leaders know. 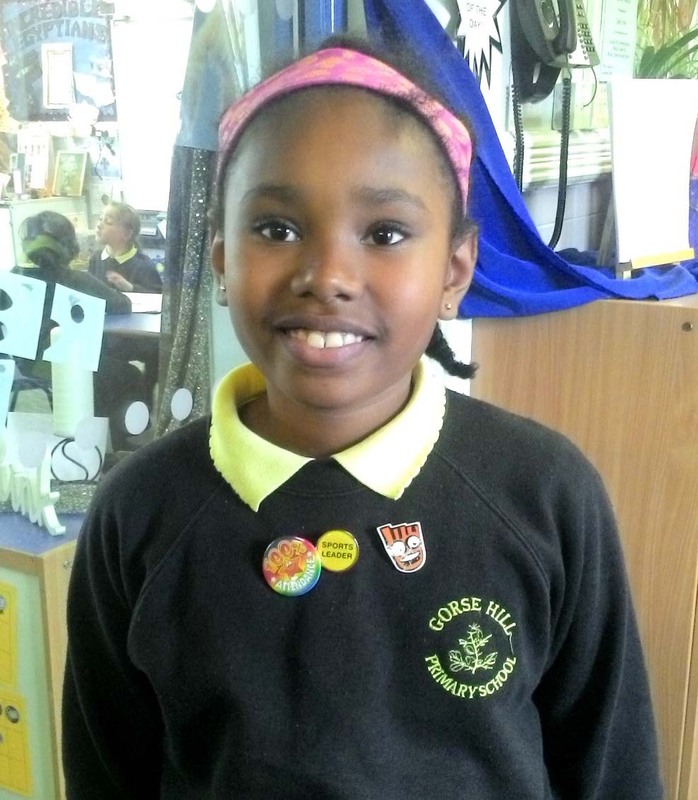 P.E Leader proudly wearing her badges.